Unclear writing, now as always, stems from unclear thinking–both of which ultimately have political and economic implications. Rationality: relying on reason rather than emotion; requiring support; ignoring claims without support; following claims and support where it leads; being more concerned about finding the best explanation than about being right; analyzing apparent confusion; and asking questions. Metacognitive self-awareness: weighing the influences of your own motives, biases, assumptions, prejudices, and ideologies. For example, about which of your assumptions are you most skeptical? 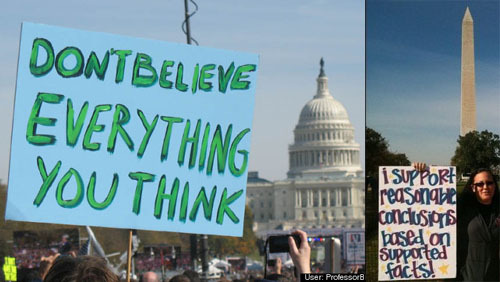 Open-mindedness: evaluating all reasonable inferences; considering a variety of possible viewpoints or perspectives; remaining open to alternative interpretations; accepting new explanations because they explain the evidence better, are simpler, or have fewer inconsistencies; accepting new priorities in response to re-evaluation of the evidence; and not rejecting unpopular views out of hand. Discipline: precise, meticulous, comprehensive, and exhaustive; resisting manipulation and irrational appeals; avoiding snap judgments. Critical thinkers are people who have developed thoughtful and well-founded beliefs that guide their choices in every area of their lives. In order to develop the strongest and most accurate beliefs possible, you need to become aware of your own biases, explore situations from many different perspectives, and develop sound reasons to support your points of view. These abilities are the tools you need to become more enlightened and reflective “critical thinker” (p. 28). Section 133: TTH 11:20-12:50 p.m.